A reliance on drugs is becoming more of a problem than ever before. People become addicted to drugs for many reasons: to escape the stresses of life, to change how we feel about ourselves, or down to pure habit. How would your life transform if you were to break the hold that drugs has over you once and for all, to get back the control and live life the way you wish? If you were in conscious control of your drug addiction then you would simply stop it, wouldn't you? If you cannot stop the addiction then it must mean that your unconscious is running your drug habit. And this is exactly where hypnosis can help. 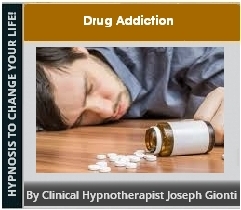 This drug addiction hypnosis MP3 download will work directly with your unconscious to release internal conflicts and re-awaken your personal power and freedom for dealing with all situations. It begins with a peaceful induction into hypnosis where you will find yourself letting go of all worries and stress. From there, you will absorb positive affirmations that will help you turn your life around and kick your addiction to drugs once and for all. Start today by switching off the addiction and install all of the resources that will give you the comfort, security and self confidence to live a drug-free life with passion! Follow these simple tips and directions and YOU TOO, will achieve the healthier and happier life that you deserve.